Containers hold genetically modified Aedes aegypti mosquitoes before being released in Panama City, Panama, in September 2014. 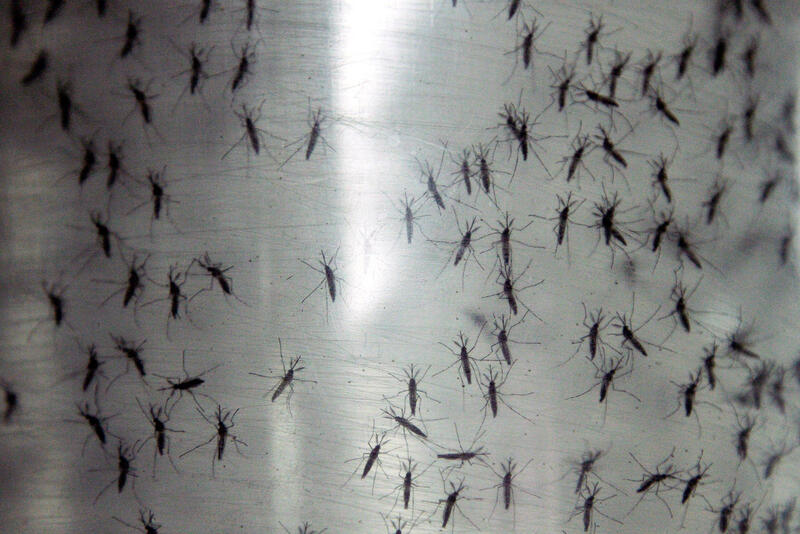 The fight against the Zika virus has a new weapon: the genetically engineered mosquito. It's recently been approved by federal regulators and may soon be available in parts of the U.S. that are confronting the virus, like Puerto Rico and Miami. The Florida Keys do not have a Zika problem at the moment, but on Aug. 5 the Food and Drug Administration approved trial releases of these mosquitoes in the Keys. But because of the vocal opposition of people there, the local mosquito control board hasn't yet approved the trials, instead putting it on the November ballot as a nonbinding referendum. Mosquito control in the Florida Keys is serious business. The Florida Keys Mosquito Control District is one of the top mosquito control agencies in the world. Six years ago, the District began looking at new technology aimed at combating a mosquito that's a serious disease threat, the Aedes aegypti. That mosquito was responsible for a dengue epidemic in Key West in 2009 and 2010 that infected more than 90 people. It's also the mosquito that carries the Zika virus. The problem is that Aedes aegypti mosquitoes have become resistant to some pesticides. Michael Doyle, the Keys Mosquito Control District director, says the genetically modified mosquitoes developed by a British company called Oxitec should get much better results than spraying with pesticides. "What we're doing now kills probably 50, maybe 60 percent of the adult females that are the ones carrying diseases. [Oxitec] is getting 90-plus percent," Doyle says. Oxitec's genetically modified male mosquitoes are intended to mate with wild females. The offspring die before reaching adulthood. When the FDA gave Oxitec the go-ahead to test its genetically modified mosquitoes in the Keys, it seemed to be in the nick of time. Miami, just up the overseas highway from the Keys, already has 30 cases of locally acquired Zika, most in the Wynwood neighborhood. Mosquito Control Board Commissioner Jill Cranney-Gage says Zika gives new urgency to the trials proposed for the Keys. "Zika is here. It's coming. We see what's happening in Wynwood. This board has to do everything that they can to protect the health and safety of the residents and our tourism and our economy," Cranney-Gage says. But vocal opponents of the genetically modified mosquitoes in the Keys say Zika is no reason for them to change their minds. Megan Hall, who lives on Sugarloaf Key, worries that it's unproven technology that could have negative unforeseen consequences for people and the environment. "Personally, I'm not afraid of Zika. I know it's a huge problem in a lot of places, and I don't discount it," she says. "I know it's terrible what's going on in Brazil and all these places — Puerto Rico. But this is not an emergency." If the board decides ultimately to give the trials the green light, the earliest they would likely start would be next spring. But Oxitec CEO Hadyn Parry says the company has asked the FDA to consider allowing a test release of the mosquitoes on an emergency basis elsewhere, perhaps in Miami. "We could do that; we're ready to deploy," Parry says. "We could do that very quickly, within about a month." On Tuesday, the Keys Mosquito Control Board agreed to allow Oxitec to use its facility on Marathon Key to breed adult males for release elsewhere. A spokesman for Miami-Dade County says there's been no discussion about using the mosquitoes there. Another possibility is Puerto Rico, where the Obama administration on Friday declared Zika a public health emergency. The fight against the Zika virus has a new weapon, a genetically engineered mosquito. It's recently been approved by federal regulators and may soon be available in parts of the United States that are confronting the virus, like Puerto Rico and Miami. The Florida Keys do not have a major Zika problem at this point. But that is where the Food and Drug Administration this month approved trial releases of these mosquitoes. Not everyone is thrilled with this idea. And local opposition has put those trials on hold, as NPR's Greg Allen reports. UNIDENTIFIED MAN: I call the meeting to order - the Florida Keys Mosquito Control District. GREG ALLEN, BYLINE: Mosquito control in the Florida Keys is serious business. It's one of the top mosquito control agencies in the world. Six years ago, the district began looking at new technology into combating a mosquito that's a serious disease threat, the Aedes aegypti. It was responsible for a dengue epidemic in Key West in 2009 and 2010 that infected more than 90 people. It's also the mosquito that carries the Zika virus. The problem is Aedes aegypti mosquitoes have become resistant to some pesticides. Keys Mosquito Control District director Michael Doyle says new technology developed by a British company, Oxitec, gets much better results than spraying with pesticides. MICHAEL DOYLE: What we're doing now kills probably 50 - maybe 60 - percent of the adult females that are the ones carrying diseases. Everything they've done is - they're getting 90-plus percent. ALLEN: Oxitec's developed a genetically modified mosquito. When the males are released and mate with females, the offspring die before reaching adulthood. This month, when the FDA gave Oxitec the go ahead to test its GM mosquitoes in the Keys, it seemed in the nick of time. Miami, just up the Overseas Highway from the Keys, already has 30 cases of locally acquired Zika - most in the Wynwood neighborhood. Mosquito Control board commissioner Jill Cranney-Gage says Zika gives new urgency to the trials proposed for the Keys. JILL CRANNEY-GAGE: Zika is here. It's coming. We see what's happening in Wynwood. This board has to do everything that they can to protect the health and safety of these residents and our tourism and our economy. ALLEN: But after five years of fighting the genetically modified mosquitoes, vocal opponents in the Keys say Zika is no reason for them to change their minds. Megan Hall, who lives on Sugarloaf Key, worries that it's unproven technology that could have negative unforeseen consequences for people and the environment. MEGAN HALL: Personally, I'm not afraid of Zika. I know it's a huge problem in a lot of places. And I don't discount it, OK? I know it's terrible - what's going on in Brazil and all these places - Puerto Rico. But this is not an emergency. ALLEN: Because of the vocal opposition, the Keys Mosquito Control board hasn't yet approved the trials, instead putting it on the November ballot as a nonbinding referendum. If the board decides, ultimately, to give the trials the green light, the earliest they would likely start would be next spring. But Oxitec CEO Hadyn Parry says the company has asked the FDA to consider allowing a test release of the mosquitoes on an emergency basis somewhere, perhaps, in Miami. HADYN PARRY: We could do that. We're ready to deploy. We could do that very quickly, you know, within about a month. ALLEN: The Keys Mosquito Control board yesterday agreed to allow Oxitec to use its facility on Marathon Key to breed adult males for release elsewhere. A spokesman for Miami-Dade County says no discussions about using mosquitoes there have taken place yet. Another possibility is Puerto Rico, where the Obama administration on Friday declared Zika a public health emergency. Greg Allen, NPR News, Marathon Key, Fla. Transcript provided by NPR, Copyright NPR.